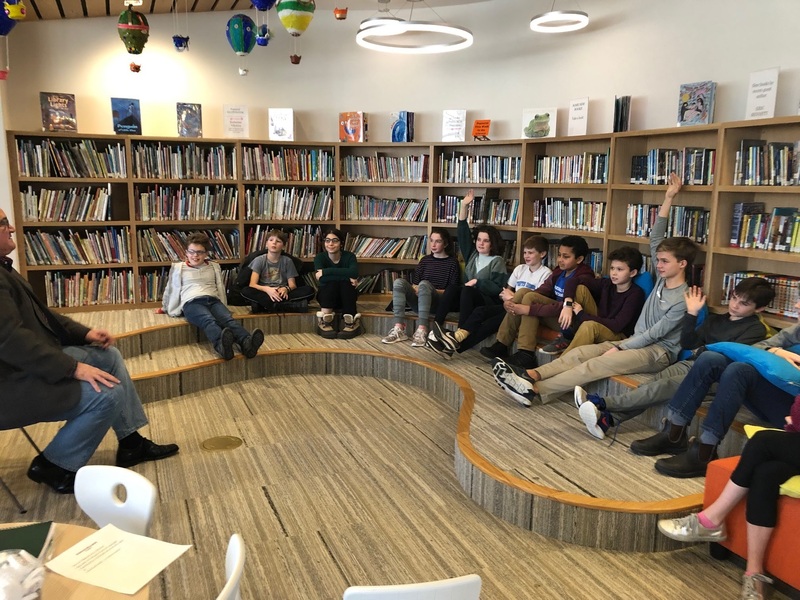 Last Friday afternoon, the 6th grade welcomed a guest speaker to the steps of the Learning Commons, where for nearly an hour, an inspirational and moving conversation around the topic of mental health and bullying was led. These are areas the 6th Grade is exploring during the investigative phase of their service learning project this year. Wayne Soares, an actor, author, and inspirational speaker, spoke to the class about the importance of taking the time to help someone who may be in trouble, someone who may be in need of help. He spoke to the value of how a simple action, like smiling at someone, asking how they are doing, etc. can make a monumental difference in their life. Throughout his presentation, which included motivational, humorous, and loving stories, Mr. Soares told of his own personal experience with bullying and how he was able to “get over the hump” of being teased in his youth. Many of these stories are easy to relate to, as any one of us may have been involved or may have witnessed a similar situation throughout the course of our lives. Mr. Soares provided the class with the message of how we can make a difference in the lives of others through words and actions. At the core of his message: it only takes a few seconds to make a person’s day a little bit better. Throughout the presentation, the 6th graders were interested and engaged and posed excellent questions. It was an informational and heart-warming experience for us all (students as well as adults!) and serves as a gentle reminder of our role as global citizens, and in what ways, no matter how small or superficial they may seem, each individual can help to make our world a better place through our words and actions. Later that afternoon, Mr. Soares delivered a broad anti-bullying presentation to Grades 3-8. Once again, we related to and laughed along with his very human stories. Please follow the link below to see a short video and more pictures from the 6th Grade visit with Mr. Soares.